Should you get a kerosene or propane portable heater? In our post-industrial world, we take a lot for granted. Flip a switch and, voila, you have light. Twist a dial and your oven begins to heat. Turn a key and your car starts. Punch a button and your clothes are cleaned. But when the power goes out at home, we’re all left in the dark. When we go camping, it’s man/woman vs. nature. Or when we’re doing an outside project, we must face the elements. A portable heater may not be top of your mind, but perhaps it should be. Unless you have a wood-burning fireplace or stove, a heater is always a good investment. To prepare ahead for a loss of power, you should also consider one of our portable generators. If you spend a lot of time outdoors or enjoy tinkering in your garage, propane and kerosene heaters from Mi-T-M will help keep you warm. Our heaters come in all different shapes and sizes and we offer dozens of portable heating options. Remember though, all units do require ventilation while in use. Where and when will you use the heater? We recommend different models for different uses. If you’re on a job site, for example, our kerosene indirect duct-able series is an excellent choice. In a ventilated garage, you might prefer a kerosene forced air model. For dinner parties on the deck, try one of our outdoor patio heaters. 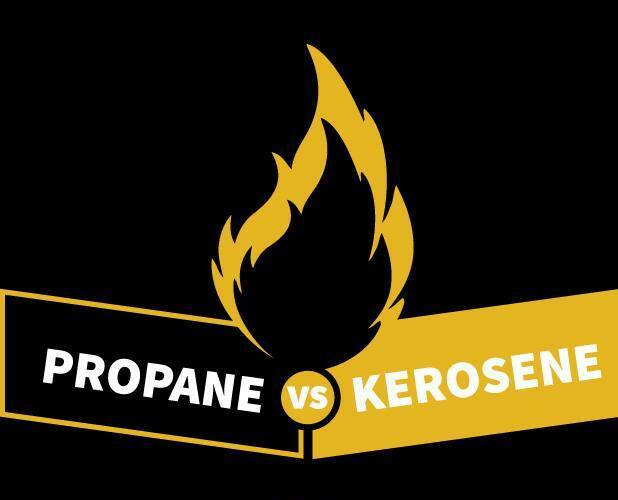 Do you prefer a kerosene or propane model? Kerosene is combustible, burns strongly, and offers a strong amount of heat. By contrast, propane is cleaner burning and can easily be found at most gas stations and grocery stores. It’s also much cheaper than kerosene. How long will you need to run the heater? A propane model running off a 20-pound propane cylinder set at low will last for 65 hours and set at high will last for 24 hours. However, if you just need some warmth while you’re tooling around in your garage, you might prefer a kerosene forced air model. Will you need to carry the heater long distances? If so, you will need to consider the weight & wheel kit of each model. If you’ll be using a heater at a job location, be sure it will be accessible. Heaters can be used in a variety of situations and locations: for emergency power outages, to heat outdoor events, to keep warm while shoveling snow, in ventilated garages and work areas, on construction sites, and the list goes on and on. Wherever you need warmth, a portable heater is the solution. At Mi-T-M, we’re happy to answer all your questions about portable heater questions. We want to ensure you find just the right heater for your lifestyle. What’s the easiest to use? Which is more convenient to carry? What’s the price difference? Let’s compare the two types and find out what’s best for you. 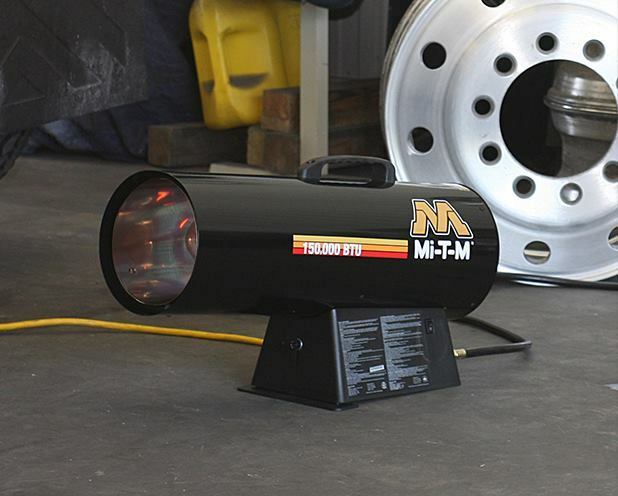 You get more heat for your buck with Mi-T-M kerosene forced air heater, which is a more powerful fuel source. The heat from kerosene heater—measured in British thermal units (BTU’s)—starting about 75,000 BTU’s per gallon. 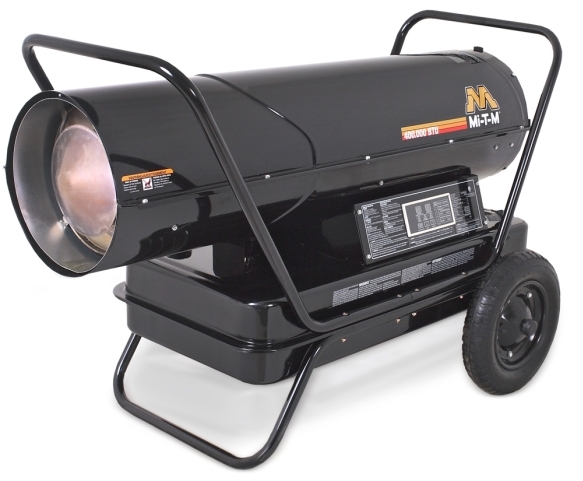 Mi-T-M Propane heaters offer BTU’s starting at 18,000 BTU’s per gallon. Therefore, kerosene will keep you warmer under the stars. Mi-T-M Heaters come in all different shapes and sizes and usually have only one or two settings, so you’ll need to determine the right size to keep you warm. 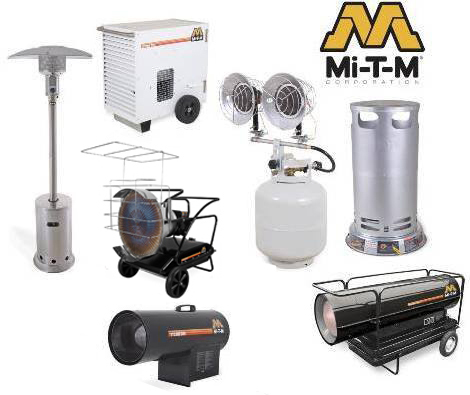 Mi-T-M offers dozens of portable heating options. The cost for each type of fuel is something else you’ll want to ponder. Let’s compare apples to apples by looking at just one state. According to the New York State Energy and Development Authority, in that state, kerosene averages about $4.20/gallon, while propane will run you around $3.10/gallon. Kerosene is combustible, burns strongly and offers a strong amount of heat. Yet propane is by far the cleaner-burning of the two fuels and it’s usually much easier to find and buy. Next you’ll want to consider how long each type of heater will keep you warm. A propane model running off a 20-pound propane cylinder set at low will last for 65 hours and set at high will last for 24 hours. Finally, think about how much weight you’re willing to schlep around. As you weigh the different features of kerosene vs. propane heaters, don’t forget to actually weigh the models themselves. Many units feature wheel kits for ease of transportation, consider how far you will need to transport your heater to and from job sites and work areas. Contact Mi-T-M with all your portable heater questions. We’ll make sure you find just the right heater. Why? We want to make sure you’re a happy camper! Hi Donny, thanks for he great question. The kerosene heater lets off less moisture than the propane. Hope that was helpful. So what is the moisture out between the two heaters, I know propane heater is about 0.98 gal pr hour at 100,000 btu, what is the kerosene water output? There should really be no moisture from the Kero /diesel heater. I have a 30-60 btu propane heater. I got it to heat an area in the garage i’m working. The problem is after about an hour it slows down putting out heat. I shake the 20lb propane tank and the heater goes back to putting out max heat for about 10 min. The temp today is 5 above. I’m thinking the cold is effecting how the propane burns. This heater does not me my needs. I’m leaning towards 150btu kerosene unit. Other than the fuel cost, what would be the downsides of using this type of heater in my garage. How many hours of usage running at 150 but would I get per gal? Hi Bob, Thanks for reaching out to us…I will check with one of you service techs & get you an answer here shortly. Thank you for your interest in our Mi-T-M Equipment. Do you plan to move towards a Kerosene fired 135k or 190k? Or do you plan to move towards a 150k LP unit? I want to make sure we are giving you correct information on the exact unit you are looking for. I am concerned about safety in terms of ventilation. Which one will give the best safety in the area of air quality while working in my 18×24 garage? I am likely to buy one today. When using Kerosene or Propane heaters you must have adequate ventilation. If you are using one of these in your 18 x 24 ft. garage you should have all doors open. For propane, we’d recommend the 18,000 BTU cabinet heater, which has a heating area of 600 sq. ft. or the 40-60,000 BTU propane forced air heater with a heating area of 1,500 sq. ft. For kerosene, we recommend the 75,000 BTU kerosene forced air heater that has a 1,700 sq. ft. heating area. We just moved into a 30 x 60 pole barn for our workshop. We are a non-profit that hires veterans to build burial flag cases for our veterans cemeteries and are the only burial flag case offered at Arlington National Cemetery. We have 2-6 veterans a day right now working in our shop. I am very concerned about fumes of a kerosene vs propane and not that educated on either. Putting a heater on and then opening the doors to let the cold back in seems odd to me. Please recommend what you think would work for us. Also, if you offer non-profits such as ours any discounts or promotions please advise. We do not recommend using our kerosene or propane heaters in any enclosed environment. It sounds like an electric heater would be best for his needs. Mi-T-M does not offer electric portable heaters unfortunately. Hope this was helpful, Thanks! Would a propane forced air torpedo heater be a viable option to heat a 15×30 enclosed tent on a deck? Would moisture be an issue? Thank you. How much ” outside air” is needed per heater.. Propane – Kerosene to keep the carbon monoxide levels at safe levels in a 650 sqft garage and should you use a certified meter for safety.. It is important to run these heaters in well ventilated areas. Having a fresh air opening of at least 3 square feet for each 100,000 BTU per hour of heater output is recommended. A larger opening will be needed if more than one heater is being used. And yes, you should use a certified CO detector while running these heaters. Hope that answers any questions you may have, Thanks!